The detained journalist sent his message with his lawyer. 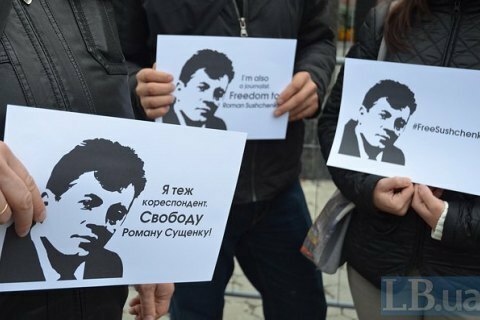 Ukrainian journalist Roman Sushchenko, who was illegally convicted in Russia, has called on Ukrainian film director Oleh Sentsov, who is serving a term in a Russian prison, to stop his hunger strike. "I have just gone out of a meeting with Roman Sushchenko in Lefortovo. He asked me to tell Oleh Sentsov that he should take care of himself and end his hunger strike. Banal words would not be appropriate here, everything is clear anyway," his lawyer Roman Feygin said on Facebook. According to Feygin, Sushchenko sent the words of support to Ukrainian ombudsperson Lyudmyla Denisova and asks everyone in capacity to arrange her meeting with Sentsov to help. "I would only add on my own behalf that the story of Lyudmyla Denisova being denied access to Ukrainian political prisoners is becoming absolutely indecent and shameful. Smugly enjoing the World Cup, the Kremlin has no shame, inventing idiotic reasons to bloc Denisova," he concluded. Russia has refused to provide any information on the health condition of Ukrainian political prisoner Oleh Sentsov, including any visual means. It also refused to arrange a video link.